BEIJING — Newspapers, TV and magazines were dominated Thursday by images of President Xi Jinping, reinforcing his public image as China's most powerful leader in decades following a Communist Party congress. 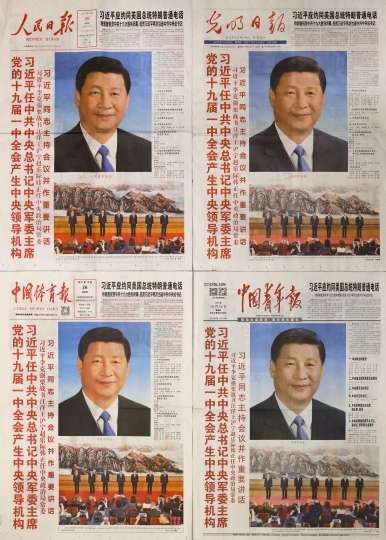 Photos of Xi took up as much as one-quarter of party newspapers and titles as diverse as China Sports News. Rows of magazines at newsstands had Xi's face on the cover. Xi has amassed more personal power than any leader since Mao Zedong in the 1970s. It is a break with two decades of shared authority among a group of senior party figures. Party spokespeople reject suggestions Xi is building a personality cult, but Thursday's media saturation adds to the most intense propaganda for a Chinese leader's personal image since Mao. "The Xi Jinping Era," said the headline on Vista magazine, published by the ruling party newspaper in the Ningxia region in the northwest. The party says Xi, appointed Wednesday to a second five-year term as leader, is the core of its ruling seven-member Standing Committee, not a lone strongman. Still, the propaganda focus on Xi is a break with his most recent predecessors — Hu Jintao and Jiang Zemin — who appeared regularly on state media but shared space with other leaders. Many newspapers Thursday featured photos of the latest Standing Committee appearing before reporters. But many of those were accompanied by large photos of Xi alone. More than 24 hours after the new Standing Committee was appointed, some state television channels still were showing repeated scenes of delegates applauding as Xi and other party leaders walked past and waved. The midday state television doubled the length of its broadcast to an hour, devoted to Xi and the Standing Committee.